Trips to my native place, sometimes, remind me of what I’ve lost by moving to a bigger city for earning a ‘so called’ decent living and a better future. Some of my childhood friends, then, had come from villages and stayed in our small town for just schooling… And now, most of my friends have either moved to metros or have migrated abroad. My relatives (and most of the mango-people, aam-junta, in smaller or bigger towns, cities) still feel that the one’s settled in States are more ‘successful’ :) . Little do they realize that grass is never, as green as they think, on the other side as well? When you look at the bigger picture, you realize that essentially we are all a ‘displaced’ community. Next thing was breakfast. After that I went to the barber. There were few ‘customers’ already waiting, I told him that I’ll come back in 5 minutes. He asked me to go to his brother’s new shop across the lane (business expansion in these days is a surely a good sign ;-)). 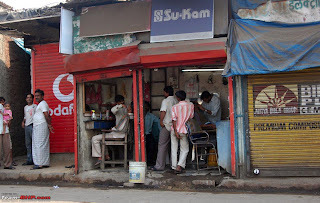 I went there… Royal Hair Cutting Saloon… I smiled and entered. I smiled because that was the very reason why I preferred him; he treated me like a royalty. Again, a “very long term engagement” :) I just love the way he massages me after the hair-cut... and damn cheap… hair cut, trimming beard and an aflatoon massage - all for just 40 bucks. I usually tip him 5-10 rupees. I never leave tips at regular places. But this is an exception. Why? Because of the quality of job he does with utter humility. It relaxes me and I really feel good and light leaving his khokha :) I’m sure I’ll get similar royal treatment at some exorbitantly expensive spa. May be much more than just a royal treatment. But I couldn’t afford that… for now my naaiee is doing a splendid job. These are just two small examples… but I guess they make a strong point of what I want to explain… that the people are so good and friendly… that the cost of living is so less… you don’t need big salaries, little is sufficient. Needs are less. Life is relaxed. You find more time for your family and your hobbies. hmmm.. didn't know that you like massages from guys :P. every blog post i learn something new about u.